During the dissolving, shaping and cutting processes of the plastic sheet in the thermoforming machine, electrostatic charge is observed on the plate and finished product. 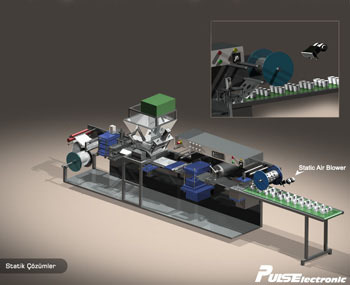 The static charge is undesirable as it will cause the dusting of the plate and the packaged product to lead into hygiene problems.To solve these problems, Pulselectronic Airblowers and anti-static bars are placed on the machine as seen. Anti-static bars ensure that the surface of the product enters the forming mold clean and free from static electricity, while airblowers neutralize the static charges that will be generated by friction on the machine, thereby ensuring operator safety and avoiding dust production at the outlet.